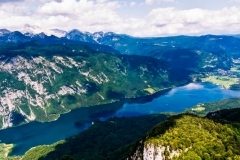 Slovenia is situated in the area of the Central Europe where four main geographical units are joining: the Alps, the Pannonian Plain, the Dinaric Alps and the Mediterranean area. This is the country full of surprises and natural treasures, as nearly the third of it under natural protection and 60% of it is covered with forest. Therefore, it is only reasonable that it is called the »Green Hearth of Europe«. 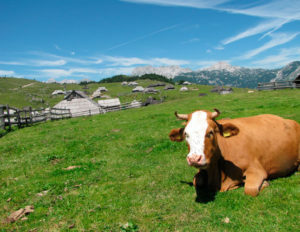 Slovenia offers you a variety of options. Wherever you go, you will be surprised to find the sea so near the Alps and the Karst; the Pannonian Plain will soon change into vast forests, and the cultivated fields will switch to the hills covered with vineyards and fruit trees. 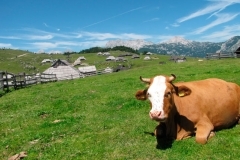 The inhabitants of this »country on the sunny side of the Alps« are hospitable, kind and hardworking. The towns are relatively small and never more than a step away from nature. Ljubljana, Velika Planina, Bled, Bohinj, Vrљi?, the valley of Trenta, Goriљka Brda, Piran, Trst, Љtanjel, Lipica, Postojna cave, Predjama Castle, Novo mesto, Celje, Maribor, Ptuj, Murska sobota, Rogaљka Slatina, Lendava. 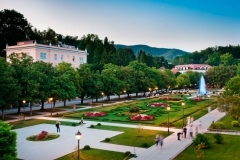 We meet at the Joћe Pu?nik Airport and will go to Ljubljana by transfer. 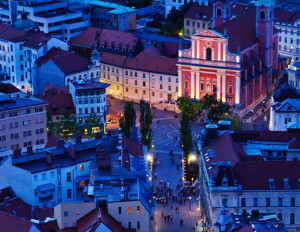 After we accommodate ourselves in the hotel, we will go for an evening walk and dinner in Ljubljana, the capital city of Slovenia, proclaimed the »green capital of Europe 2016« by European institutions. 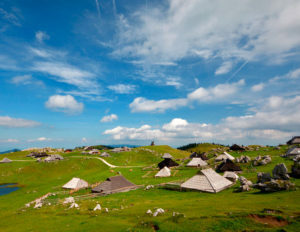 After breakfast, we will go on an easier trip to see the shepherds` settlement of Velika Planina, one of the rarest settlements of this size in Europe, which is appealing to the visitors, due to its’ impressive architecture, throughout the whole year. It is most alive during the season from June to September when it is full of shepherds and cattle. In that period, we can try some homemade dairy products and the traditional shepherd’s meal – sour milk and »ћganci« (a sort of mush). 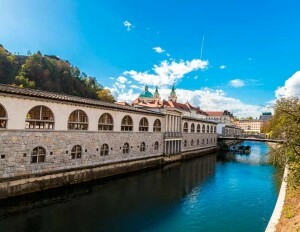 After the return to Ljubljana, a short break for rest will follow, and then the visit to the Preљern`s Square, Tromostovje (three bridges), Town Square with its baroque fountain, Town Hall and the Cathedral of St. Nicholas. We will climb the Ljubljana Castle Hill with its panoramic view of the city. In the evening we will have a dinner in a traditional Slovenian restaurant. 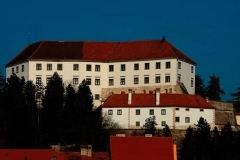 After breakfast, we will take the transfer to Novo mesto with a short stay at the Oto?ec Castle. If the weather is nice, will go on a raft trip on the river Krka and visit a vineyard cottage, where the local people produce spirit from wine. We will continue past Rimske Toplice to Celje, an old town, known already in Roman times. 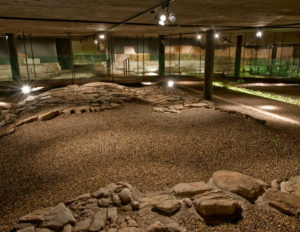 We will walk through the old city, visit the museum with the exhibition Celeia – the Town under the Town and the Old Castle. 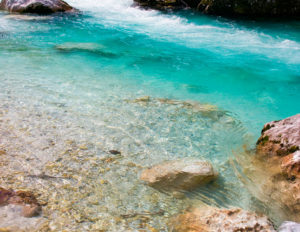 The itinerary continues then to Rogaљka Slatina, known for its mineral water that has its sources in the depth of 280 to 600 m. »Donat source water« belongs to the mineral waters of the highest quality, as 1 litre of water contains 1000 mg of magnesium. 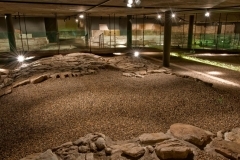 The spa is over 400 years old. The crystal glass products from Rogaљka are also known all over the world. Later we will have some free time for enjoying pools, saunas, etc. and will stay overnight. 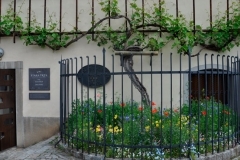 We will start our day by travelling to Maribor, the second biggest city in Slovenia and the home of the World’s oldest grape-producing vine – a 400 years old vine, located on Lent. 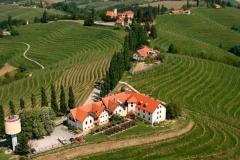 There is also the winery with the best wines of Љtajerska region. On the other side of the river, we can see the oldest BMW advertisement – originating from the times of the second World War. 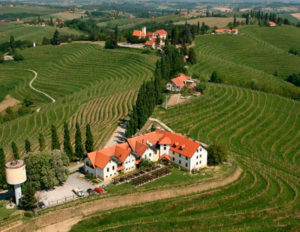 The itinerary then continues to the Vinarium Tower in Lendava, from which there is the breathtaking panoramic view of the plains and hills of Slovenia, Hungary, Croatia and Austria. Our next stop is Jeruzalem, the viticulture jewel of Љtajerska. 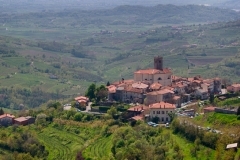 The wine road leads to the summit with another magnificent panorama. We will also have a chance to taste some of the delicious local dishes and visit the home of the production of the best pumpkin seed oil, characteristic for this part of Europe. The short sight-seeing of the town Ptuj follows after, as it used to be an important Roman fortress. There we will visit Ptuj Castle and in the evening return to Rogaљka Slatina, where there will be enough time to swim in thermal water, or to use wellness facilities, and finish the day in an even more relaxing way. We leave Rogaљka Slatina and continue our way to another part of Slovenia – Gorenjska region, where we will visit the medieval town of Љkofja Loka, and from there on further to the most renown tourist place in Slovenia – The Lake of Bled. We will walk through the Vintgar gorge (if the weather allows it), that had been created by the wonderful green river Radovna. 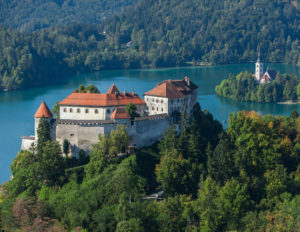 The Bled Castle, first mentioned in the year of 1011 is one of the oldest Slovenian castles. From the castle, situated on a steep cliff rising from the lake, we will be able to see the astounding surrounding mountains and valleys. 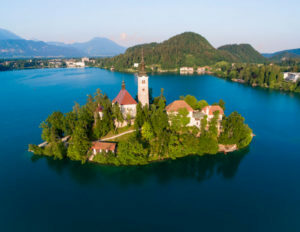 After leaving the castle, we will cross the lake to the Bled Island with the boat called »pletna«. The small church on the island has its origins in the Middle Ages, but was restored during the Baroque period and has a self-standing tower with the »bell of wishes«. Following to this comes dinner and overnight stay. We will start our morning with an easy walk in the mountain plain of Uskovnica, situated among some of the most picturesque Slovenian summits. 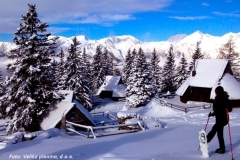 We return to Pokljuka then, the mountain plain covered with beautiful pine forests, where the competitions of the World Cup in biathlon are taking place, and where the heart of the Triglav National Park is. 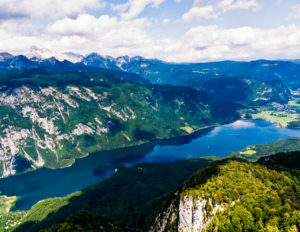 The beautiful mountain road will lead us to Bohinj with its’ glacier lake, the largest in Slovenia. 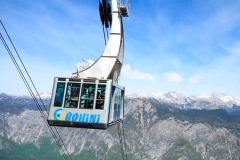 If the weather allows, we will take the cable car to Vogel and see the mountains and the lake from another point of view and then return to Bled for overnight staying. 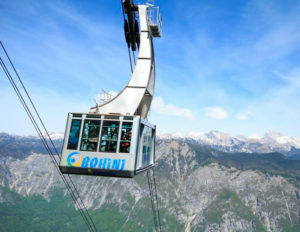 On our way to Primorska, another wine region, we will stop in Planica with an entirely new nordic center with 8 ski jumping hills and the large flying one, where every year the final of the World Cup in ski jumping is held. 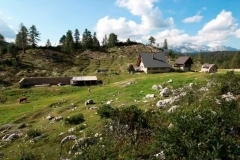 The itinerary continues over the road pass Vrљi?, the highest pass in Slovenia, joining two Slovenian regions; Gorenjska and Primorska, leading to the valley of Trenta. The road over the pass was built during the World War I by over 1000 Russian prisoners. To those who died there, the Russian chapel has been raised. The road descends to the valley of the river So?a, where we stop for the fresh trout or sheep and goat cheese on one of the tourist farms. Because of its colour, the river So?a is called »the emerald beauty«. Passing Kobarid and Most na So?i we will continue our way to Goriљka Brda, to the old village of Љmartno with its’ old walls and abundance of stories about the wars between Venetian Republic and Habsburg dynasty, proclaimed as the monument of the highest importance. 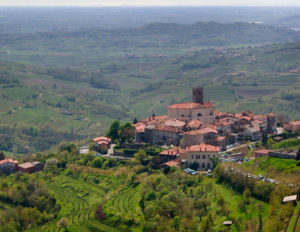 Because of the nature there, Brda are called »Slovenian Tuscany«. We will stay overnight in one of the tourist farms there, that also produces excellent wines. Before continuing our trip to Trieste, we will make a short stop in Љtanjel, one of the oldest towns in the Karst region. This small but lovely town will charm you with its’ beautiful garden Ferrari and the castle it belongs to. 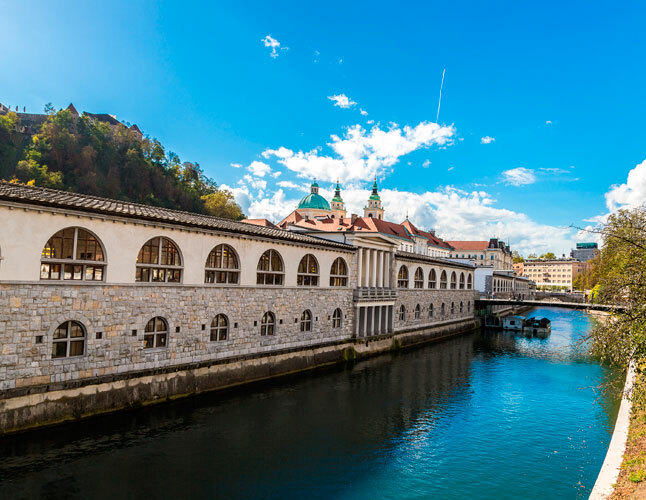 Next in our itinerary is sight-seeing in Trieste, a city of great importance for the Habsburg dynasty and ruled by many more throughout history, with the second biggest port in Italy. 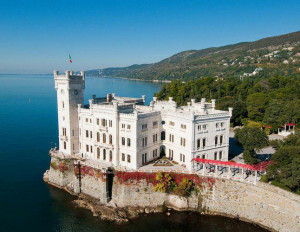 We will see the centre of the city and the mesmerising castle Miramar, built by Archduke Ferdinand Maximillian I for himself and his wife Charlotte of Belgium. 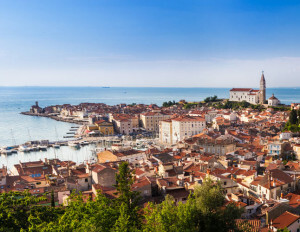 The road following the Slovenian coast leads to an old and lovely town Piran, also called »little Venice«. 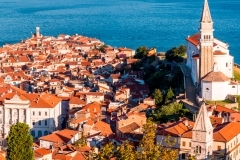 There we will walk through the narrow streets and beautiful squares up to the church of St. George, to see the view on Croatia, Italy and nearby salt fields. The salt there is acquired from the sea in a unique, traditional and natural way, with the help of the sun, petola mud and the wind. After, we will head to Portorose, a tourism resort, for an overnight stay. After breakfast, we will visit Lipica Stud Farm, where the home of the Lipizzaner horse is, and one of the Europe’s most famous cave, Postojna cave. 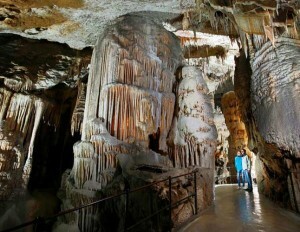 With its 20 km cave system, it is the most visited cave in Europe and one of the largest Karst landmarks of the world. The guided tour of the cave is conducted partly by the underground train and partly by foot. We will be able to see a large Concert Hall, the most famous cave animal – the Olm, and the biggest trogloditic amphibian in the world. 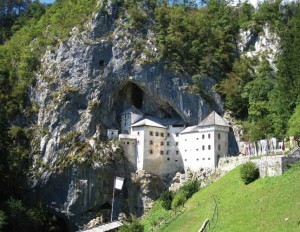 We will also see the Predjama Castle, partly built in the cave in the middle of 123 m high cliff. The first castle was famous because of its owner, the rebel knight Erazem. Today’s castle is from the Renaissance period and incorporates a museum. Our travel comes to an end in Ljubljana, where the remaining afternoon is free for exploring Ljubljana on your own. A minimum of 6 guests are necessary for a mini-van for 6 to 8 people. 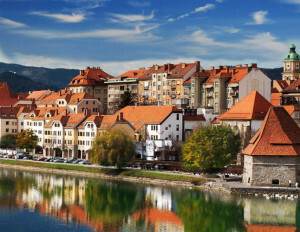 Your private driver is an experienced licensed guide, who will see you through a detailed itinerary of Slovenia locations. 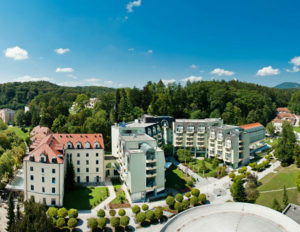 It includes: Pick up at the Ljubljana Airport, transfer from and back to the airport and all necessary transportation, guided tours, 9 hotel accommodations and overnight stays in double rooms with breakfast in 3 or 4 * hotels, using the thermal pools, entrance fees to: Postojna Cave, Predjama Castle, Miramar Castle, Slovenian lunch with wine degustation, cable car to Velika Planina, The Tower Vinarium Lendava, Old Castle Celje, rafting on Krka, Ptuj Castle, museum CELEIA – Town under Town, Vintgar gorge, Bled Castle, »pletna« boat ride, cable car to Vogel, Slovenian lunch with wine degustation, Gonjace Panorama Tower, organization of the journey and English speaking guide. The price does not include: additional entrance fees, tours and excursions, services at special orders, lunches, dinners, travel cancellation insurance, additional health insurance with medical assistance abroad and anything else that is not expressly mentioned under “the price includes”. In case of unexpected events (weather conditions or other natural inconveniences), we can change the order of visits and sometimes the contents. 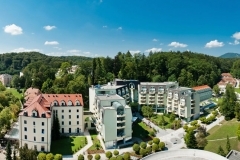 Price includes: Pick up at the Ljubljana Airport, transfer from and back to the airport and all necessary transportation, guided tours, 9 hotel accommodations and overnight stays in double rooms with breakfast in 3 or 4 * hotels, using the thermal pools, entrance fees to: Postojna Cave, Predjama Castle, Miramar Castle, Slovenian lunch with wine degustation, cable car to Velika planina, The Tower Vinarium Lendava, Old Castle Celje, rafting on Krka, Ptuj Castle, museum CELEIA – Town under Town, Vintgar gorge, Bled Castle, »pletna« boat ride, cable car to Vogel, Slovenian lunch with wine degustation, Gonjace Panorama Tower, organization of the journey and English speaking guide. Price does not include: additional entrance fees, tours and excursions, services at special orders, lunches, dinners, travel cancellation insurance, additional health insurance with medical assistance abroad and anything else that is not expressly mentioned under “the price includes”.